Duerk, Judith. 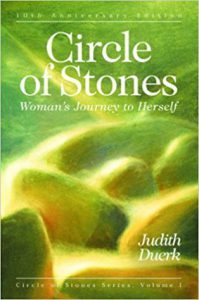 Circle of Stones: Woman’s Journey to Herself. San Diego, CA: LuraMedia, 1989. How to bless and nurture our feminine energy. Used on the Woman Within initiation weekend (http://www.womanwithin.org).